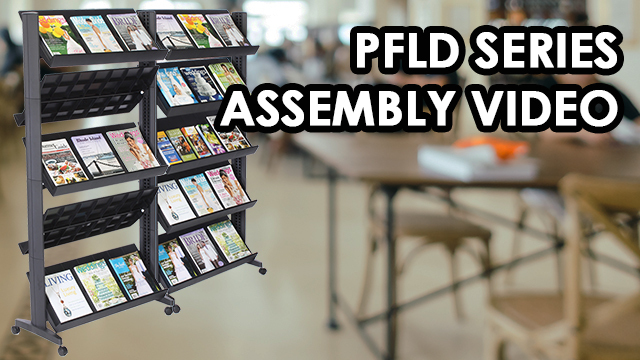 This portable 5-pocket silver plastic magazine stand is a lightweight but sturdy freestanding literature display rack with four caster wheels. 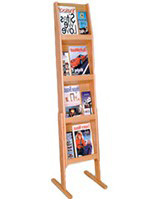 The heavy duty acrylic fixture has five hanging 10" wide lipped shelves that can face in either direction for a custom design. 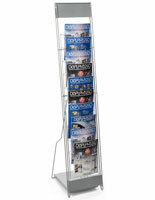 The heavy duty 5-pocket silver plastic magazine stands are five and a half feet tall to maximize floor space usage. 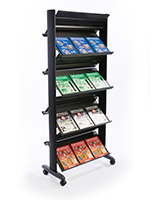 This type of mobile acrylic literature or book rack is a great choice for lobbies, waiting rooms, conference areas and trade shows. 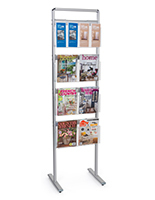 The versatile freestanding silver plastic magazine stands with rotating shelves make it easy to create a custom design rack to hold flyers, brochures and other reading or marketing materials. 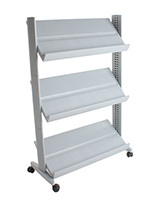 13.8" x 65.0" x 15.0"
10.8" x 13.0" x 1.4"